There will be a new fine mineral show at the National Western Complex, called simply the Denver Mineral Show. The longstanding Colorado Mineral & Fossil Show has changed ownership and will be at a new location. Welcome aboard new owner, Sandra Gonzales; and a heartfelt, sad goodbye to Marty Zinn and his great staff (Regina, Rose and Laura). CMFS will no longer be at the Radisson on 48th and Bannock, but is moving to the Crowne Plaza Hotel at 15500 E. 40th Ave — 11 miles east on I-70 and a 22-minute drive. The original show, the Denver Gem & Mineral Show at the Denver Mart, 451 E. 58th Ave. — known to some as the “Main Event” — is celebrating its 50th Anniversary this year with an apt theme of “Gold and Silver”! The Denver Showcase is the second largest multi-show event of its kind in the U.S., second only to the 40-show Tucson Gem, Mineral & Fossil Showcase, which is held over a 2½ week period in January and February each year. In fact, if gem shows or showcases are rated in size by their total number of vendors, the Denver Showcase is the fourth largest in the world: Tucson has 4,000, Munich (DE) has 2,000, Sainte-Marie-aux-Mines (FR) has 1,000, and Denver has 900. Exhibits are at the heart of all “club shows” and are right in line with most clubs’ mission statements to educate. The Denver Gem & Mineral Show provides a rare opportunity for local and regional institutions, but also groups all over the country and around the world, to showcase their gem, mineral fossil collections and discuss the pieces in their exhibit with attending visitors. At the same time, exhibits provide visitors with the motivation and examples for starting, advancing, and/or ideas about how to curate their own collections. Among these coveted awards, the Prospector, Junior Prospector, and Club Prospector trophies are awarded to the best personally collected specimens found during the prior twelve months. The prestigious Pearl Trophy is awarded to the best specimen entered into a special competition named for Richard Pearl, noted author of Colorado Gem Trails and Mineral Guide, among many other mineral books. The Denver area is home to an enthusiastic community of collectors many of whom are members of one (or more) of eight local gem, mineral & fossil clubs. These clubs make up the not-for-profit Greater Denver Area Gem & Mineral Council, which, in turn, puts on the annual Denver Gem & Mineral Show. Each club variously brings speakers to the area, offers children’s programs, and hosts field trips, symposia, shows, auctions and social events. Many club events are open to the public, and should you decide to join a club, fees are modest. 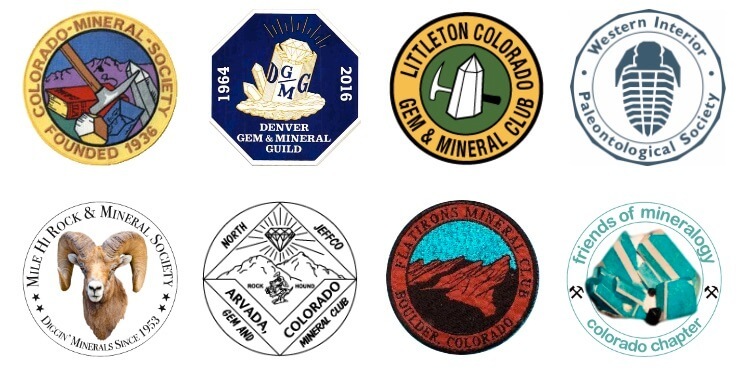 The eight seals in the cover photo represent the eight clubs that make up the Greater Denver Area Gem & Mineral Council. Go to http://www.denvermineralshow.com/clubs/ and link to the clubs’ websites.